About 6pm yesterday, it did not look like a yard sale. Then my wonderful friend showed up with her two boys and a neighbor kid dropped by. By bribing the 4 boys and taking complete and total advantage of my amazing friend, we got everything out of the house. I had no idea who good that would feel. It was enough stuff to fill a 2 car garage. And it was all in my house. And I don’t really need it. Wow. Crazy. I got up early and with about an ocean of coffee, started unpacking, arranging and most important, Facebooking. Posting pictures with descriptions and prices on all the cool stuff, responding back to requests for info and basically, learning to host a social media yard sale. It’s Friday, I haven’t put up a sign and already I’ve had a dozen people stop by. Haven’t made much money, but a lot of stuff has gone that I never, ever have to wash, dust or otherwise tend again. And the people who took the stuff look pretty happy. That makes me happy. No I guess I need to go make a big sign to put up so I get passing traffic this weekend. It’s so windy. I’m going to need a major board with something heavy to weight it down. 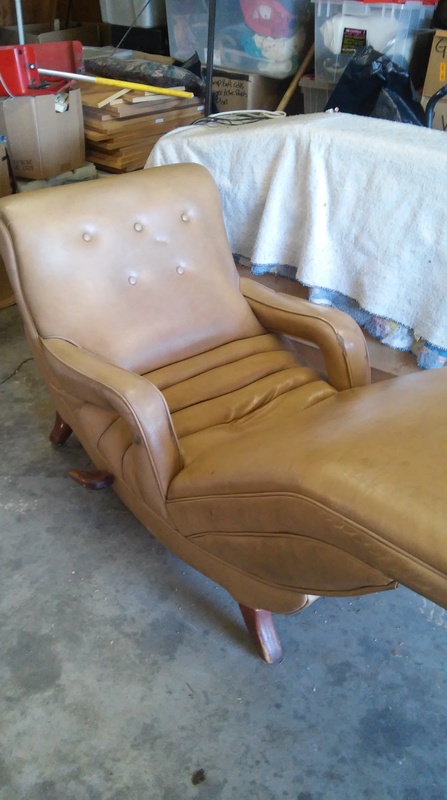 Must go because my last cup of coffee is wearing off and I need to go nap one more time on my mid-century Art Linkletter, countour lounge chair before someone buys it.